I have not written about my sabbatical work for a while. As my sabbatical stint involving protein crystallization approaches the finish line at the end of December, I realize that I have learned a lot of new things. Take, for instance, what we did today with Elena (I blogged about our joint work on several occasions). We recently got some exciting new crystals of a protein I won’t disclose right now (it is just too early in the process). The nature of the protein is not that relevant as I just want to cover an interesting process related to improving crystal quality. We have struggled to crystallize this particular protein for some time. The crystals we have produced prior to today did not diffract well. To improve their quality, we resorted to seeding, which started by us fishing out our imperfect crystals under the microscope, followed by grinding them using a simple device shown on the left side below. What you see is an Eppendorf vial with a small polystyrene ball in it. When you add to this vial the mother liquor together with your low-quality crystals and vortex them, the ball breaks them up into tiny pieces. Under the microscope, you can actually see them as sharp little fragments suspended in liquid. We made this “crystal slush” last Friday. Today we set up the hanging drops that you see above. Each location is sealed by grease and contains an aqueous buffer (with some additives) at the bottom. Using 0.1microliter volumes you set up hanging drops that have various combinations of the protein of interest and the buffer. Most importantly, to each drop you add 0.3 microliters of the “crystal slush” suspension. That’s it. You do all of this on a thin round piece of glass, invert it, and place it above the buffer solution in each of the 8 locations shown above. 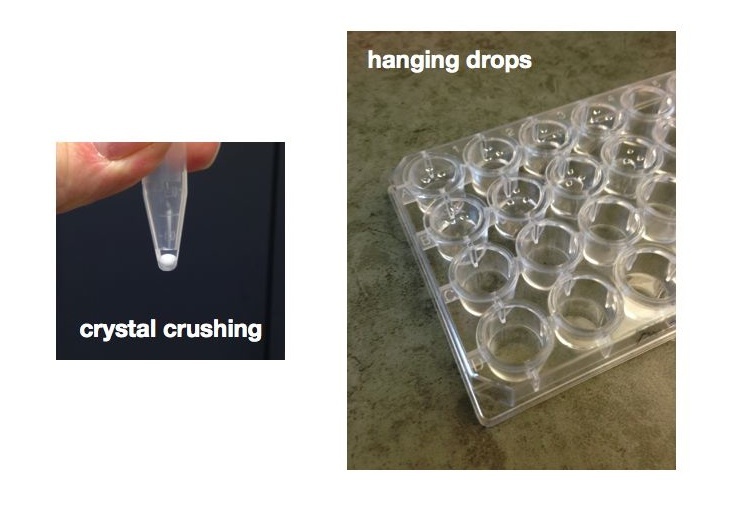 Despite gravity, the drops do not fall because of the high surface tension of water… I think we need to take a lot of these protein crystallization tricks into the synthetic organic domain. Personally, I have never tried careful concentration adjustment as a means to drive crystal formation. For Elena, though, there is an enormous difference between 1.25M, 1.3M, and 1.35M protein solutions. Apparently, such spectrum of concentrations can play a huge role in determining the success of crystallization. We’ll see what happens. The main lesson for me is that progress is slow and you just have to be patient. Alas, this is one skill I left behind in my postdoc days… Elena keeps me in check, though!